The premium denim brand 7 For All Mankind has reopened its Power Plant Mall Boutique in a new location. 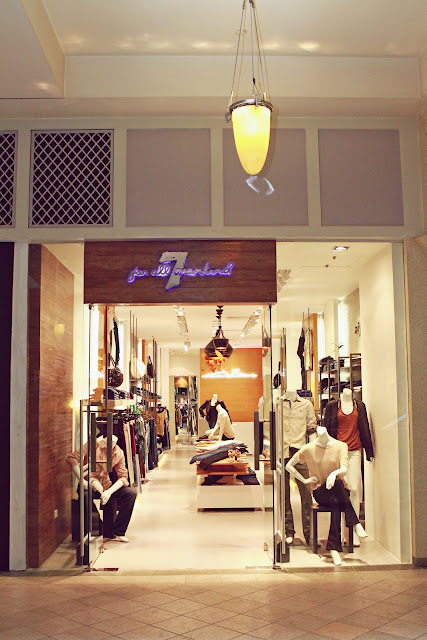 Just a few steps from its old home, 7 For all Mankind now resides at the Power Plant Mall’s Level R2 presenting a new store concept similar to its international counterparts in Berlin, Sweden, Rome, Denmark and many more. The new store's concept was designed to express the spirit that the California brand instills in all its collections: luxurious detailing and modern elegance. High ceiling and the store’s architecture juxtaposition of warm and cold materials adds to the elegant atmosphere. The 74-square-meter store features men’s and women’s denim, apparel and accessories collections. Cement-finish walls display the brand’s latest denim offerings and alternate with natural oak paneling for a refined look. A large, natural zebrawood display table with undulating top is flanked by freestanding units with the same cement finish used in the flooring, pulling together design elements to create a harmonious atmosphere. Products available include men's and women's denim, ready-to-wear and accessories collections from Fall Collection 2012 showing gorgeous cuts and luxe fabrics inspired by the natural world, new collection that has a beautiful, organic feel – printed denims, metallic shine and rich colours feature heavily alongside luxurious knits and fashion-forward styles. This season, 7 For All Mankind takes its inspiration from nature by using the elements to reinterpret denim. From the mountains to the valleys to the beach, it’s about taking beauty from nature and the natural environment around Los Angeles. Women’s Fall takes guilty pleasures at High Shine Patterns, Pebble Washed Look, Metallic Denim, High Octane Twill, Riche Touch Denim, and Slim Illusion Denims. Exciting, fresh and innovative, these are sure to be the sexiest attention grabbers of the season. Shop this September at 7 For All Mankind Boutique in Power Plant Mall on Level R2 to enjoy exciting perks and privileges.